I’m making the leap into the world of social media. I’ve been blogging for a really long time now (I’ve got 8 years worth of posts in the archives) but I never really latched onto the social media push that has happened in the last year or so. A lot of that probably is due to the fact most of my friends aren’t into it either. So, here’s my stab at becoming more social! 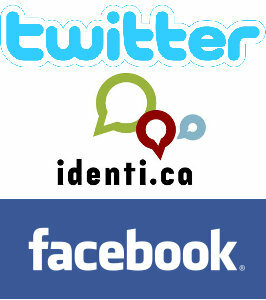 You can follow me on Twitter or you can follow me on Identi.ca. If you are on Facebook, you should be able to track me down there too (well, assuming you are someone I know in real life otherwise I’m probably not going to add you to my friends list. Sorry.). This entry was posted in General, Technology and tagged blog, Facebook, Identi.ca, Social media, Social Networking, Twitter on 2009/04/11 by Jeff Ivany.